This is the cover of my Faith Journal. 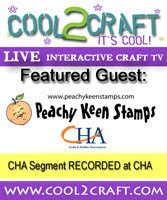 This is a Splitcoaststampers Challenge started by Lori Craig. Each month for a year we do either a card, journal page, or something with a scripture verse printed on it. It can be whatever we choose. I thought this was a wonderful way to inspire creativity, and well as enhance my spiritual life. You can join this challenge at any time by subscribing to the BVC08 thread on splitcoaststampers.com. 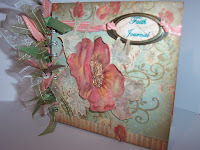 This little journal is the 5x5 On Board Art Journal from Stampin' Up! I covered it with some of my favorite K&Company paper, and watercolored the rose and rose buds (from the Wild Rose stamp set) with Groovy Guava, , Creamy Caramel, and Summer Sun. I used crystal effects and microbeads for the center of the rose, and after it was completely dry, I gave it a wash with Chocolate Chip ink to give it an aged appearance. The title for my journal is computer generated. This was a lot of fun to make, but I did have quite a bit of time involved with all the watercoloring, as well as ribbon cutting.